..... 'Sugarbakers' ... new, revised and updated edition now available. ... from sweat to sweetness"
1) AGFHS Bookshop in person at meetings and family history fairs. 2) AGFHS Bookshop postal service (sterling cheque payments only). 3) GENFAIR ... secure online ordering. Click here. "Beginning in 1544 and reaching its heyday in the 18th and 19th centuries, the sugar refining industry in Britain was noted for a high proportion of German immigrants. In fact, it was possibly the most common profession Germans worked in, hence the interest of the Anglo-German FHS in the subject. Society member Bryan Mawer has given the matter its first dedicated study. Sugarbaking is a word literally translated from the German in the absence of an existing term to describe labourers in sugarhouses. Mawer describes the process as "the hot, sweet-smelling, unhealthy processes ... that killed our ancestors early". It was tough physical work, as Mawer explores in one of the chapters in this book compiled from his extensive combing of archives, old papers and firsthand accounts. Three chapters form the main body of the book, of which the one on the work itself is the third. The first introduces the people who did the work, particularly through the stories of specific individuals who came from Germany - in the mid-19th century, censuses show that nearly 30,000 people living in Britain were of German birth. The second chapter explores the geographic distribution of the sugarbaking industry, which had particular focal points around Bristol, Chester, Lancaster, London, Edinburgh and Glasgow, each of which Mawer takes in turn to see what records, stories and buildings survive. Throughout, useful charts and original illustrations help to create a rich picture of an industry that has been largely neglected. Family historians with sugarbaking ancestors will lap up the rest of the book too: four appendices provide background detail such as a list of sugarhouse fires (a constant hazard) and a directory of sugar refineries, while an index of surnames mentioned in the book runs to around 350 different families. Further resources are available at the author's website www.mawer.clara.net where more than 21,000 individual names are listed, along with wills, maps, refinery details and other resources. Bryan Mawer is to be congratulated for spotting a gap the market and filling it with some impressive and accessible research which will interest anyone who is fascinated by industrial heritage." "The British have a notoriously sweet tooth. For centuries people in Britain worked long hours in appalling conditions to turn raw sugar into crystals that could be added to drinks and puddings and made into confectionery. Many were immigrants, especially Germans. In [this book] Bryan Mawer looks at the history of the job in companies all over Britain and how it was carried out. There are appendices on fires, a constant hazard, and a directory of sugar refiners. Although he concentrates on Germans involved in the industry, there is much information for those with non-German ancestry whose forebears helped to feed the national passion for sugar." "This title - the new edition of an original booklet from the Anglo-German FHS - provides an in-depth history and insight into the working conditions suffered by those Germans who set up in the trade as immigrants in the UK. Helpful to those interested in the sugar industry, especially those with German ancestors. Also for anyone interested in learning more about sweets and the confectionary trade, which was heavily influenced by German immigrants." 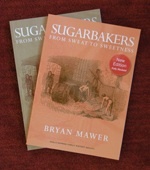 "Bryan Mawer, the author of this long-awaited book, is an AGFHS member and runs the highly acclaimed sugarbakers' website at www.mawer. clara.net. Bryan describes how the term 'sugarbaker' derives from both the Dutch 'suikerbakker' and the German 'Zuckerbacker' and tells us that the English and Scottish sugar refining industries commenced in 1554. The peak years were between 1700-1900, however, and it is on this period that Bryan concentrates. He describes the who, where and what of sugarbakers and sugarbaking and has four splendid appendices: sugarhouse fires - they were extremely prone to fires and other accidents and thus were reported on in newspapers; sugarhouse advertisements - usually announcing the sale of premises and itemising the contents; an extremely useful and extensive directory of sugar refineries and last, but not least, a reading list. The last two are not incorporated into the surname index - which includes everyone (German or not) that Bryan has come across in his research [for this book]. I recommend this book not just to those who have discovered sugarbaker ancestors but to all who are fascinated by the history and development of this country." 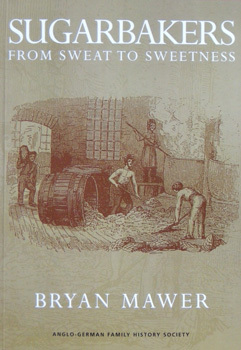 "Subtitled 'From Sweat to Sweetness', this book has been written for the Anglo-German Family History Society (AGFHS) by Bryan Mawer, who has his own website on the subject www.mawer.clara.net. The book will be of interest to anyone with sugarbaker ancestors, German or not. Sugarbakers were those who worked in Britain's sugar houses or sugar refineries and the book describes in depth the terrible conditions those working in the industry had to endue, and much more." "It is nice to see a Family History Society publishing a useful book which it makes available to its members at a discounted price. This specialist subject covers such a range that it could be of interest to anyone having a possible German or sugar industry connection or who is interested in manufacturing. German nationals first came to Britain from about 1659 to participate in the manufacture of sugar. Marrying and having families and then 'sometimes' returning to their native lands leaving a destitute family behind in Bethnal Green, St George's in the East, as well as other major cities. 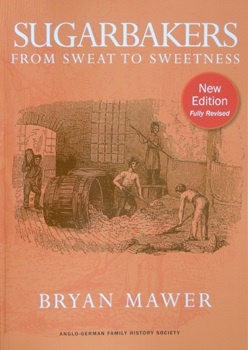 The book describes in detail the making of sugar with much technical information of how it could take 2-3 weeks for each batch to be produced. For those of us who have seen a sugar loaf in a museum this is of interest. There is a wonderful contemporary description of a sugar works in the East End in 1876 depicting all the drudgery and disgusting working conditions of the time. Fires and explosions could occur, such as those at Well Street and Breezers Hill, St George's in the East, and these are listed in Appendix 1 from 1749-1895."